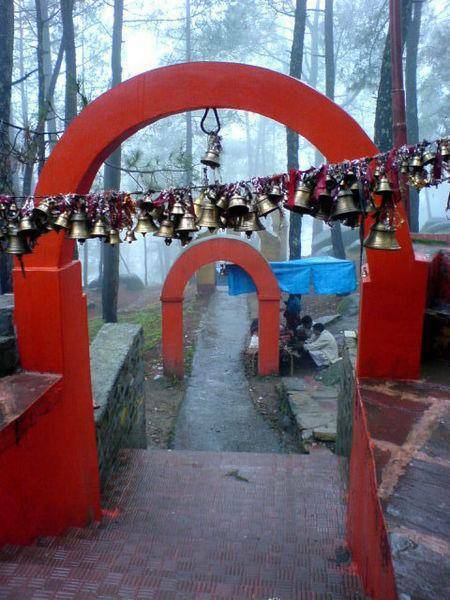 Also just eight kilometers from Almora , this temple has hundreds of bells hanging at its entrance. Pilgrims and worshippers at the temple hang the bells. It is believed that by hanging a bell you can give thanks, or ask for a wish to be granted. Temple is located in village called Chetai and “Golu Devta”, is beleived to be an incarnation of Gaur Bhairav. The temple is adorned with countless brass bells of all sizes, letters written to the deity by the devotees and even stamp papers with details of legal issues the court verdicts of which the devotees are dissatisfied with. The legend doing rounds says that a devotee can write a letter to Golu Devta stating his wishes or even have cases, the court verdicts of which have not been in their favor, on stamp papers pasted on the temple walls, believing with a clear conscience that the deity will grant them their wishes. On fulfillment of the wish the worshipper must return with a brass bell of any size and tie it up at the temple as a mark of gratitude to the deity.